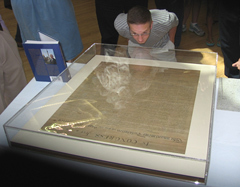 A visitor to the State Historical Building views a copy of the Declaration of Independence. A rare print of the document that launched this country 234 years ago will be on display at the State Historical Building through Saturday. The copy of the Declaration of Independence was printed in 1843 from a copper plate that had been commissioned by former President John Quincy Adams earlier to give copies to the signers of the document. This copy had been stored in obscurity in state archives until a box of Civil War love letters was found on the porch of a home by historical researcher Bob Johnson of Altoona. Johnson asked Senator Dennis Black of Lynnville to write a book based on the letters, and along the way they made another discovery. Black says included in the box along with the letters were several other documents, including a receipt for the copy of the Declaration of Independence given to the owner when she donated it to the state in 1947. The document was donated by Mary Thorton of Davenport, the granddaughter of Samuel and Marty Thorton, the couple that wrote the Civil War letters. Black says the idea worked for awhile, but it got difficult to put the copies in the book and the decision was made to stop the idea after about one-thousand copies were made. The Iowa copy is one of the one-thousand and is printed on rice paper. The copy was unveiled in a ceremony today that included Governor Chet Culver. Black says they are continuing to research the background of the Thortons to positively confirm they were relatives of the signer of the Declaration. He says Matthew Thorton signed the original Declaration of Indepenced near the bottom. The State Historical Building is open from 9 a.m. to 4:30 p.m. Tuesday through Saturday.